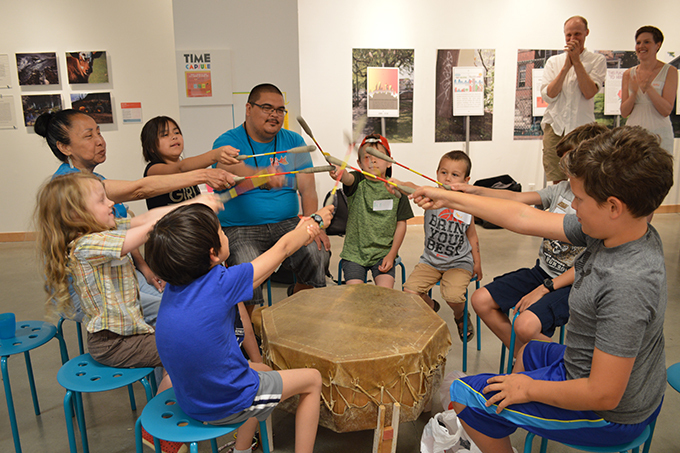 June at ArtStarts on Saturdays in Vancouver and ArtStarts at River Market in New Westminster was all about National Aboriginal History Month! Kat, Phabion and Paul from Red Fox Healthy Living Society led our families through a journey in Indigenous knowledge through drumming, dancing and storytelling. The group brought a large elk-skinned cedar drum traditionally used in pow wows where community members gather around the drum to play together. 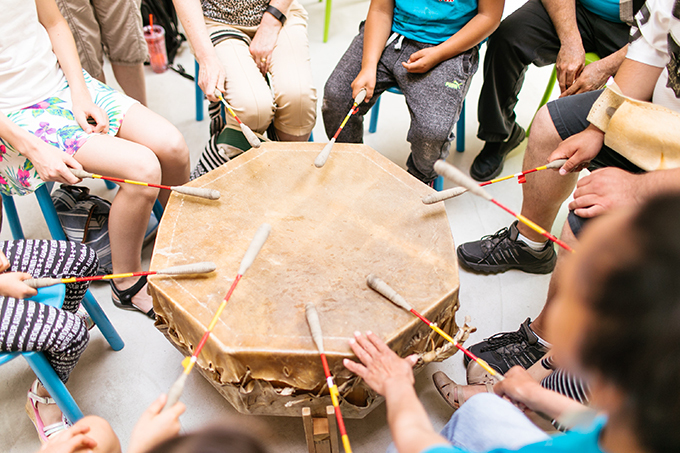 Families first got to warm up the drum by gliding their hands on its surface and welcome it into the space. They learned the proper drum etiquette, learning how to properly hold and hit the stick, follow the lead and to celebrate in campfire style... after the group has done a good job by raising the sticks together in the air, screaming "Marshmallows!" Kat shared and taught a number of songs to the group, including a welcome song written by Chief Dan George, a song to honour women (particularly used to remember the missing Indigenous women in Canada) and a song to honour men. But perhaps the kids' favourite song was one about Mighty Mouse! "Is it a bird? No! Is it a plane? No! Oh my gosh, it's mighty mouse!" After belting out their voices and drumming, families transformed into ravens, eagles, frogs and bumblebees, as depicted by different First Nations dance groups. Kat also demonstrated a shuffling step she grew up dancing and still dances today in her sixties! Besides just fun songs and dances, Kat shared why it is so important for her to share this knowledge. In her lifetime, aspects of Indigneous cultures in Canada were banned from happening and her mother and herself had both attended residential schools. It is a an important reminder that the last residential school in BC closed only 21 years ago. Today, as truth and reconciliation is happening across the country, it is important to share the stories and trauma that today's elders in Indigenous communities across the country went through and acknowledge the inter-generational trauma that still exists today for many communities because of this history. 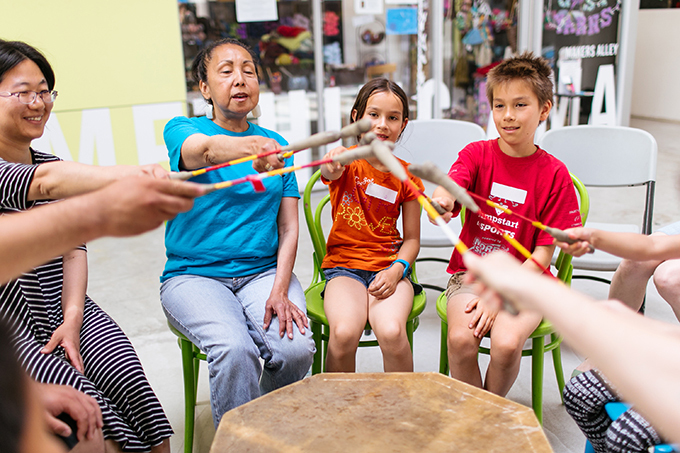 By celebrating and sharing cultural practices such as the dancing and drumming, we are not only celebrating National Aboriginal Month but also helping revive the vibrancy of Indigenous cultures that are such an important part of this land. We were so grateful to Red Fox for sharing with us! Thanks to August Studios for kindly sharing their wonderful photos from the performances at River Market! Join us next time for Me, Myself & I with Kellie Haines! Ventriloquist Kellie Haines sings new songs from her most recent album, The Story of Me, Myself & I, with Magrau the tricky bird and Kamilla the curious frog. This hilarious show is inspired by Kellie's childhood and blends musical numbers with fast-paced ventriloquism comedy. Join Kellie and her colourful friends in this fun and interactive show that highlights that being different isn’t only okay… it's extraordinary! Join us at the ArtStarts Gallery in downtown Vancouver on Saturday, July 29 and River Market at Westminster Quay in New Westminster on Sunday, July 30 for free events at 11 am and 1 pm. 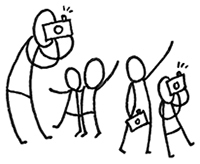 All ages are welcome! Learn more. 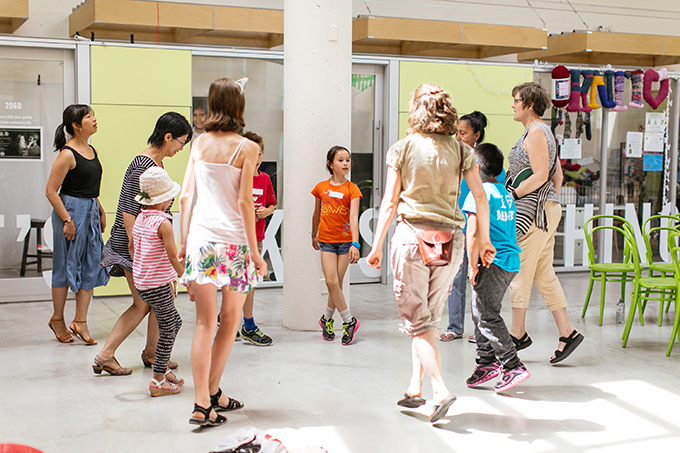 Also check out ArtStarts Explores, our brand new drop-in workshop series for creative and adventurous families held from 11am to 12pm most Saturdays. Learn more.